As the workers go off every morning, lining up at Starbucks and preparing to earn their daily bread, American drones take off from secret silos somewhere in the desert, seeking out their intended victims – and some not intended. As the sounds of normalcy stream in through an open window – leafblowers in the distance, chirping birds crowding around the feeder, children brawling in the schoolyard – the news that the NSA is collecting our emails seems irrelevant. We go about our business, and the political class goes about theirs – the former quite ordinary, the latter quite another story altogether. A new study shows our noble crusade to "liberate" Iraq killed half a million people. It is impossible to even imagine such a crime: the mind shuts down in the face of those numbers. I can’t even visualize half a million dead bodies – can you? And that doesn’t take into account the sanctions, which killed hundreds of thousands more, mostly old people and children. Nor does it include the number we killed in the first Gulf war – we’re surely up to a solid million dead by now. 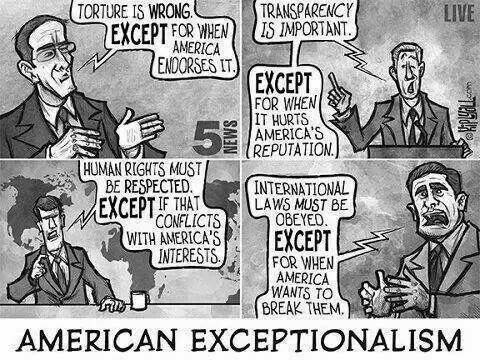 Getting away with this is what we call "American exceptionalism." God (or Nature) punishes evil, eventually – but not us. 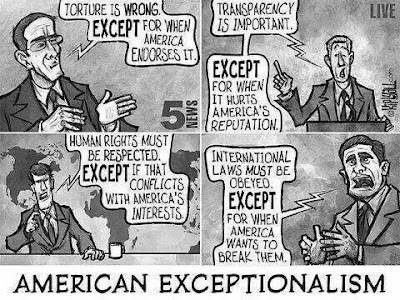 We’re the exception.